Scar Symmetry have certainly been making waves with their most recent release, Holographic Universe, so it's fitting that vocalist Christian Alvestam's side project, Miseration's debut album is finally getting a worldwide release after being out for over a year in Sweden and Japan. Of course, seeing as this sort of thing is dime-a-dozen these days, you have to carve out your own niche to stand any chance of denting a few heads. 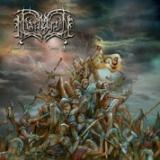 And Miseration have chosen to stand out from the melodeath masses by being, well, not that melodic. No, instead of slavishly adhering to the Gothenburg sound, Miseration take a fair bit of influence from their cousins across the pond to make something far more brutal and nasty than we tend to see from this genre. But fret not, there's still enough catchy guitar harmonies here to keep fans of the genre listening. There's quite a lot of clean vocals smattered throughout the album, which admittedly feel a bit out of place at times considering the crushing nature of the music. Still, Alvestam's melodic voice is strong enough to stop it from really detracting too much from the album. It's worth mentioning that all instrumental duties are handled by Jani Stefanovic, and he certainly turns in an impressive performance. He's no slouch at any of his instruments, and he's as comfortable shredding on guitar as he is hammering out some blastbeats. The record opens up with Thrones, and it's by far the strongest track here. It's a slab of pure death metal that at times sounds like Meshuggah on speed. Alvestam's clearly an underrated vocalist, and his death growl is thick and full enough to rank up there with the best. But of course, placing your best song right at the start of the album cripples you some what, and when listening to the rest of Your Demons-Their Angels there's little voice telling me that none of these songs are quite as good as Thrones. Still, to say the album is just a one song album would be massively unfair. Noctivagant is almost as crushing as the opener, throwing chaotic riffs at you left right and centre. Chain-Work Soul is admittedly the most commercial track here (that chorus might be a little too syrupy for me) but the clean vocals are juxtaposed with some of the oddest, most angular riffing on the album. I'd be lying if I said Your Demons-Their Angels is perfect, of course. Some of the songs lack their own identity, and the album starts to blur together for the last three or so songs. Despite the fact that some songs are entirely too short (Seven Are The Sin is cut short just as it really gets going) perhaps the album's brevity works to it's advantage. Unfortunately, the album may well be largely ignored, too heavy for much of the melodeath crowd, too slick and polished to for deathsters. This record may well be doomed to be overshadowed by Scar Symmetry, which would be a shame considering the talent on display here. Fans of Alvestam's main project should certainly give this a go.